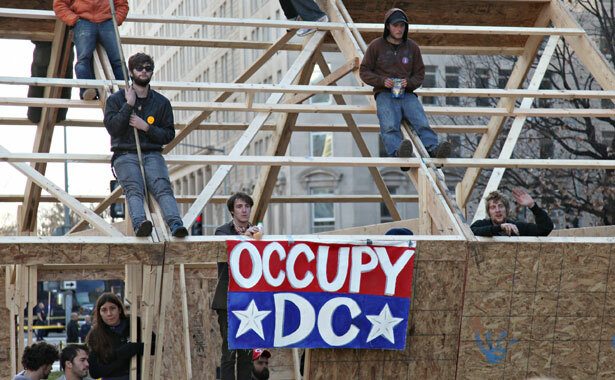 Members of Occupy DC waving from the interior and rooftop of an uncompleted, modular wooden structure that they had assembled overnight in McPherson Square. Image courtesy of flickr user Bullneck. It was a busy weekend for the Occupiers in Washington. Sunday morning, the protesters at McPherson square began erecting a large, prefabricated wooden structure in the middle of the park. The idea was to use it as a meeting space during the winter months, as cold winds pick up in Washington. The structure basically resembled a small house or barn. As one might imagine, the federal park police, who have jurisdiction over McPherson Square, were not pleased about downtown Washington’s newest building. Though relations between the park police and the protesters have been calm until now, officers notified the Occupiers at 11 am yesterday that the structure had to come down. The Occupiers say they were meeting to decide a course of action when the police surrounded the structure and began making arrests; thirty-one people were ultimately arrested for either crossing a police line or disobeying a lawful order. Meanwhile, “Take Back the Capitol” events are planned for this week across the city. This is a separate endeavor from what’s happening at Freedom Plaza and McPherson Square—it’s a collection of labor, faith, community and other groups that wants to draw attention to the plight of the 99 percent. Unlike the Occupy movement, “Take Back the Capitol” has direct political goals: they plan to occupy Senate Minority Leader Mitch McConnell’s office, swarm K Street lobbying firms and camp out near the national mall. “For far too long, Congress has been catering to the 1% instead of representing the 99%… Now more than ever, Congress needs to see us and hear us,” their website says. We’ll have coverage of these events as they unfold throughout the week.